'WILSON' WAS NAMED FOR HORTICULTURALIST AND AVOCADO SPECIALIST WILSON POPENOE WHO INTRODUCED THIS VARIETY AND MANY OTHERS TO FLORIDA. IT IS AN OLD VARIETY THAT HAS FADED INTO OBSCURITY DESPITE BEING A FANTASTIC FLAVORED FRUIT. 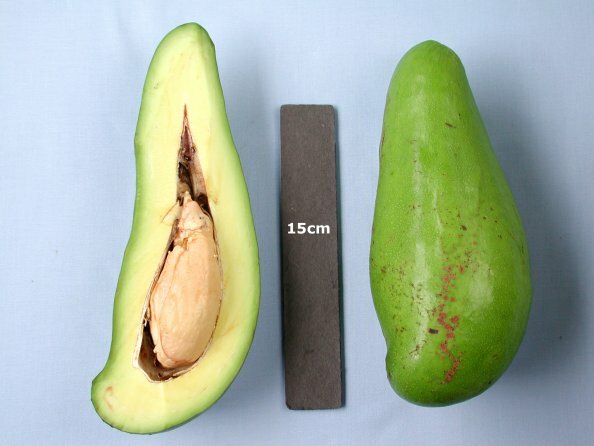 MEDIOCRE PRODUCTION, LARGE FRUIT SIZE, AND A BIZARRE SHAPE MAKE THIS VARIETY UNPOPULAR WITH COMMERCIAL PRODUCERS. CONTRARILY THEY ARE GREAT FOR DOORYARD GROWERS, BECAUSE THEY ARE A GREAT QUALITY FRUIT AND PRODUCTION IS MORE THAN ADEQUATE WITH YIELDS OF 100-200 LBS. PER SEASON.